Delaware Supreme Court Justice Randy J. Holland will speak at Wake Forest Law at noon on Thursday, April 7, in the Worrell Professional Center, Room 1312, as part of the Business Law Program’s new Sager Speaker Series. Professor Omari Simmons will interview Justice Holland in a “Conversation With” style format. The Sager Speaker Series is named for Thomas Sager (JD ’76), former vice president and general counsel for Dupont Co., and current partner at Ballard Spahr LLP. Mr. Sager was a strong and early proponent of diversity in the legal profession and helped pioneer the DuPont Convergence and Law Firm Partnering Program, or DuPont Legal Model, an industry benchmark that has received national acclaim for its innovative approach to the business of practicing law. “The Business Law Program is an excellent opportunity for students to enhance their readiness for the challenges of an increasingly complex legal environment,” says Sager, who is also a current member of the Law Board of Visitors. 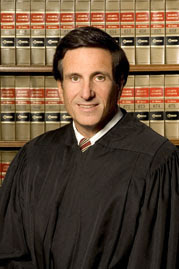 Justice Holland is the youngest person ever to have served on the Delaware Supreme Court, to which he was appointed in 1986. In March 2011, the governor of Delaware reappointed him to a third term, for which he was unanimously confirmed by the state senate. Before his time as a justice, Holland was a partner at Morris Nichols Arsht & Tunnell in Wilmington, Delaware. He was also the national president of the American Inns of Court Foundation, chair of the national Advisory Committee to the American Judicature Society’s Center for Judicial Ethics and the American Bar Association National Joint Committee on Lawyer Regulation, as well a member of several other committees. Justice Holland has received numerous awards, including the 2014 American Inns of Court Powell Award for Professionalism and Ethics, 2012 First State Distinguished Service Award, and the 2011 Dwight D. Opperman Award. In 2004, he was elected to be an Honorable Master of the Bench by Lincoln’s Inn in London. He has also written, co-authored or edited nine books. He received his bachelor’s in economics from Swarthmore College, his J.D. from the University of Pennsylvania Law School and a Master of Laws in the Judicial Process from the University of Virginia Law School. He received two honorary Doctor of Laws degrees, one from Widener University and one from Swarthmore College. The Business Law Program is a student-centered program designed to expand student opportunities that strengthen knowledge of business law concepts as well as develop skills to assist professional development and readiness for practice. Professor Simmons, who teaches Contracts, Business Associations, Advanced Corporations, among other courses, is the director of the program, which launched in Fall 2015.